WHAT IS THE I S S ? Founding of the International Shaw Society (“The ISS”) was first discussed at a Shaw Conference at Marquette University in April of 2001, and the ISS was successfully founded in principle at a “Shaw Summit” on August 24th, 2002, at the Shaw Festival Theatre in Niagara-on-the-Lake, Ontario, with the details of its scope and operation yet to be worked out. To discuss and vote on such matters, a second “Shaw Summit” was scheduled in the new Shaw Festival Theatre Library in Niagara-on-the-Lake, Ontario, on August 20th, 2003. A decision was made at that time to apply for not-for-profit, tax-exempt status, and Professor Richard Dietrich of the University of South Florida was elected Acting President to oversee the transformation of the ISS into a full-fledged, legally-established, dues-paying literary society. As of January 30, 2004, the ISS was legally established as a 501(c)(3) corporation with the U.S. federal government and the state of Florida, with Professor Dietrich elected as its Founding President, in which capacity he served for the first six years, 2004-2009. The second ISS President was Professor Leonard Conolly of Trent University, serving from 2010-2012. The third ISS President was Professor Michael O’Hara of Ball State University, serving from 2013-2018. The fourth ISS President is Professor Robert Gaines of Auburn University at Montgomery, beginning in 2019. 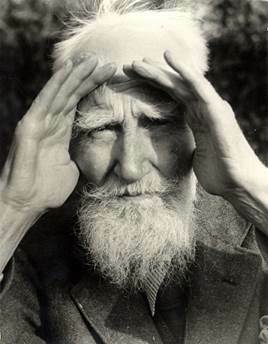 The International Shaw Society will provide a means for those interested in the life, times, works, and career of Irish playwright George Bernard Shaw and his circle to organize their activities and interests, exchange information and ideas, and promote an interest in Shaw worldwide. The acronym for the International Shaw Society, “ISS,” is especially appropriate to emphasize Shaw’s continuing presence in the contemporary world as a talkative spirit with very relevant things to say, and the suggestion of a hiss on “ISS” evokes Shaw’s portrayal of the serpent in the Garden of Eden (in Back to Methuselah) as a friend to man in encouraging the species to grow and learn, rather than to continue stuck in the old, stagnant, often self-destructive ways. The Shavian voice, urging Homo sapiens to grow up, has never been more needed. Growing up, in fact, is probably what Shaw had in mind when he urged evolving to Homo super, “the Superman.” Desperate metaphors for desperate times! Which will always be with us until we do grow up. Shaw’s “Superman,” by the way, has nothing to do with either the Nazi version of WWII or the Clark Kent comic book version. See his play Man and Superman, which satirizes the only character who sometimes imagines himself a Superman. A father for it, maybe, but even that he resists.